Real talk: I have been looking for a black jumpsuit forever. I have tried them on everywhere from Neiman Marcus to Target, and just couldn't seem to find one that was right. I had some specifics—I wanted sleeves and wider legs—but otherwise was open to all sorts of styles. I brought some challenges to the table, too, as I have a freakishly short torso, which makes dresses tricky too. So as with dresses, I finally figured out a jumpsuit style that works for me: one without a defined waistline. But unlike with dresses, finding this in a jumpsuit presented a bit of a challenge. Thankfully, at long last, I finally found one that works for me, and here's how I've been wearing it. 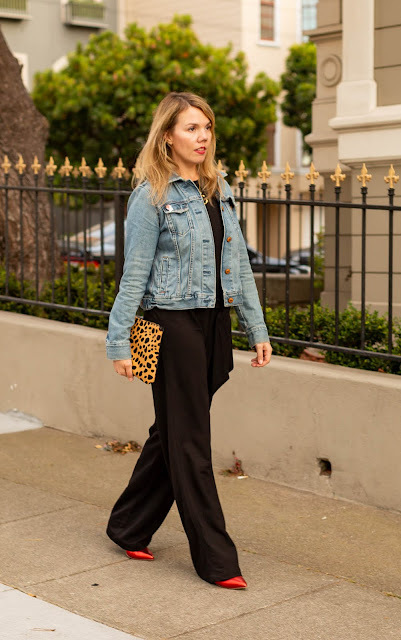 The winning jumpsuit is by Mango, which sadly no longer has a store in San Francisco, but at least has a website with speedy delivery to the West Coast. It is fitted on top with elbow-length sleeves (which, sorry, you can't see very well in these photos) and wide-leg pants. The genius, though, is the fit through the waist, which is pretty straight and forgiving. The detachable belt can be tied however you like, so in my case, I was able to lower it a bit to accommodate my short torso (and make myself look somewhat more proportionate). It has the added benefit of disguising my food baby, which makes it the perfect thing to wear on Thanksgiving, if you're still looking for an outfit. I am wearing a size small, and I'm super happy with the fit. It is still unseasonably warm in San Francisco, so I'm wearing a denim jacket here (you've seen this one countless times, most recently here). If I were going for a dressier vibe, I'd wear a leather jacket, but I thought the denim kept things nicely balanced between casual and dressy. I'm sure you have a denim jacket by now, but if you don't, this one is by Gap and it's just so freaking good. The cut hits the top of my hip at the most flattering place, hence why I wear it all the time (because it just looks great with everything)! I went a little dressier with my accessories here—the leopard clutch (last seen here, but sadly sold out now) definitely says nighttime, and while I wear my Hermès bracelets during the day all the time, they're a little on the fancier side. The necklace is new, and I bought it after seeing it on Pinterest! 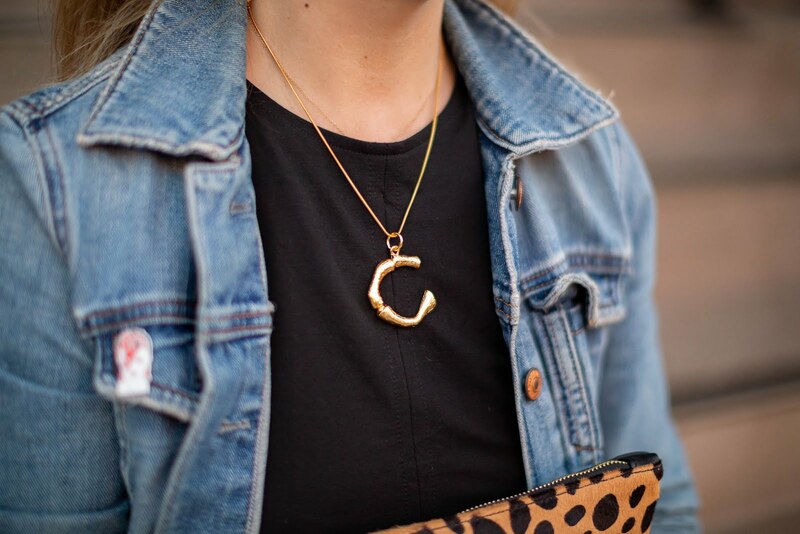 It's a blatant knockoff of the Céline necklace, which is not crazy expensive but is sold out everywhere, and I wanted to make an homage to Phoebe Philo, who is no longer the designer there, sadly. 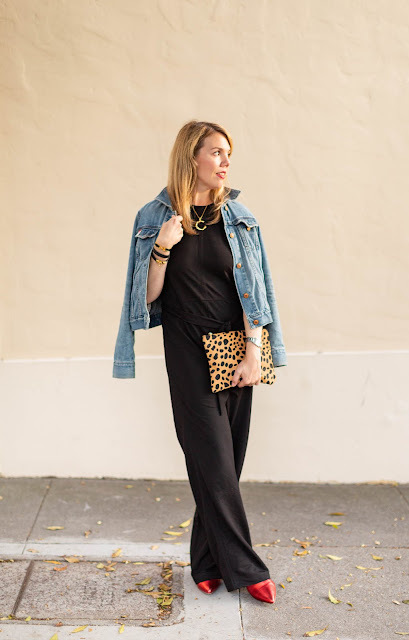 The jumpsuit is very PP in vibe too—minimalist and loosey-goosey—so I thought the necklace just worked so well, especially with the jumpsuit's higher neckline. There's nothing terribly exciting to report about this location, other than it's my neighborhood, and it's lovely, and we squeezed in this shoot right after Zuni's vet appointment. I look at photos like this, taken in November (!) and feel so lucky to live in San Francisco. And I also feel lucky to finally have found a jumpsuit that fits me! Can you believe it's almost Thanksgiving? Me neither, but I've teamed up with a bunch of my favorite bloggers to show you what we're wearing on Turkey Day. 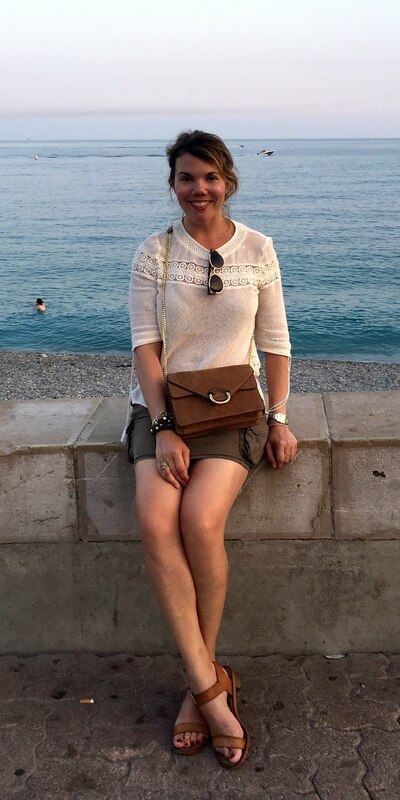 Please stop by these lovely ladies' blogs and say hello—tell them I sent you! First of all: HOW AMAZING do you look?! 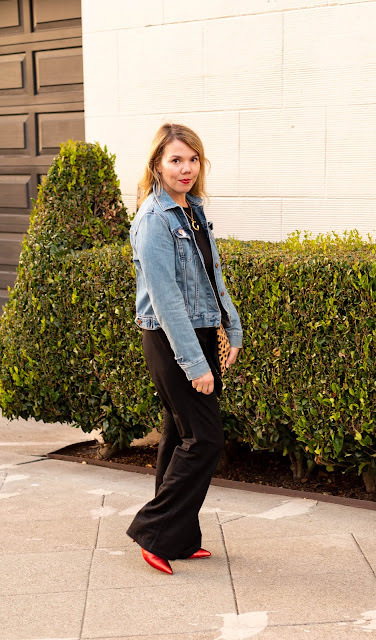 Hands down my most favorite outfit shared in our Holiday post today! I love it so very much. Those metallic red booties caught my eye. Too bad they were cheap AF. That means you need to find a replacement (and yes I am an enabler lol). I am so glad you found the perfect black jumpsuit for you. I have yet to find mine. I'd love it sleeveless, with short sleeves or cap sleeves and a wide leg like yours. I used to shop at Mango quite a bit when I lived in Europe, they had great items and somewhat affordable - meaning the prices can get high for some of the pieces. Also Cheryl, all of your jewelry caught my eye. The necklace and those bracelets are all fun and modern! Cheryl, I love this chic and sassy look! Those booties are fantastic. What a bummer that they are chipping. You still look amazing though! You look so gorgeous! I love the idea of adding a jean jacket. 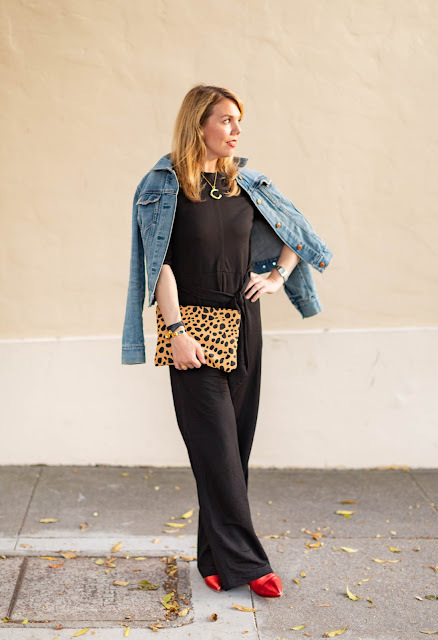 I am loving how you styled this jumpsuit, Cheryl! 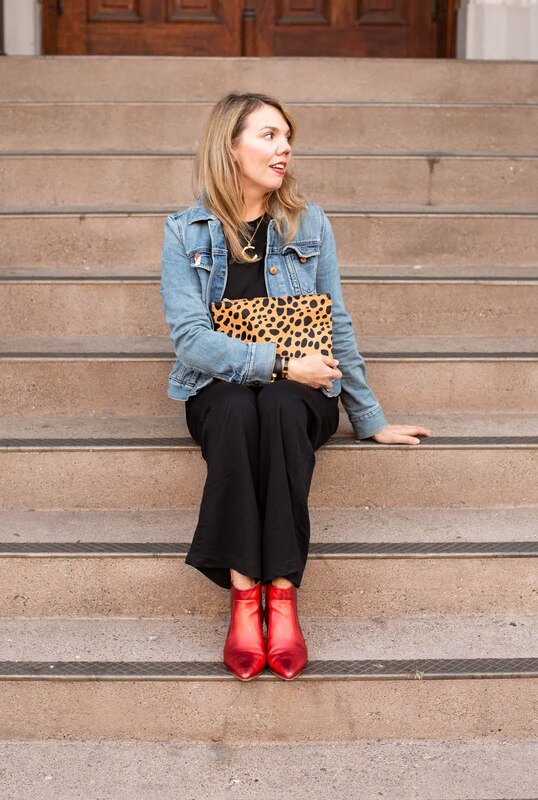 Your red booties add such a great pop of color and it's a perfect Thanksgiving outfit. Jumpsuits always look great. They're so elongating and they always look elegant even though they are comfy like pj's. Love this combination! Especially those red boots. 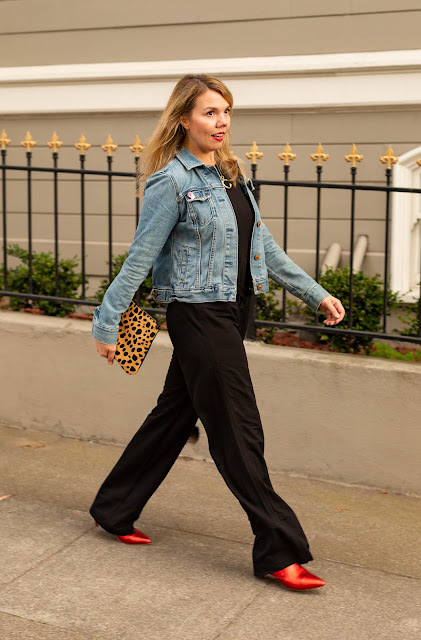 I've never styled a jumpsuit, but I'll keep these tips in mind! Very stylish! 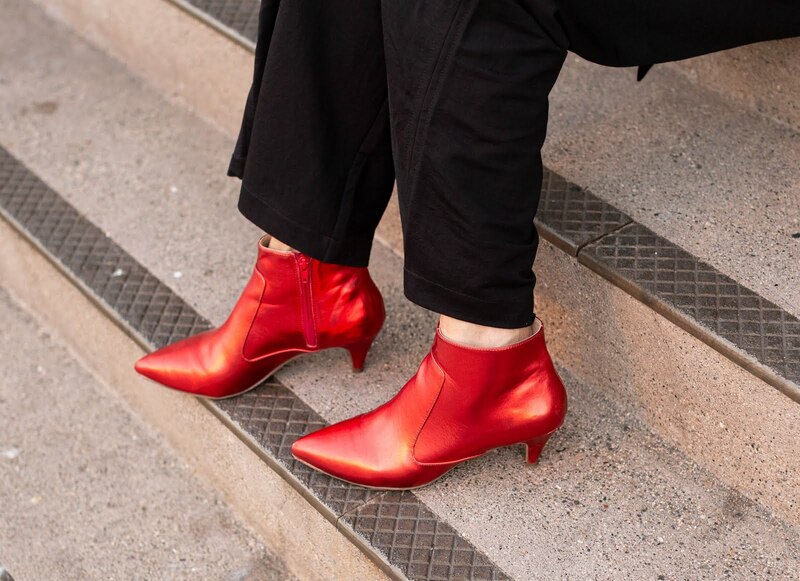 Aw, that is too bad about your red booties, they do look fab on you! The style I love. Your jumpsuit is very elegant, love the wide legs. I dont have many jumpsuits as I need length and some are too short. 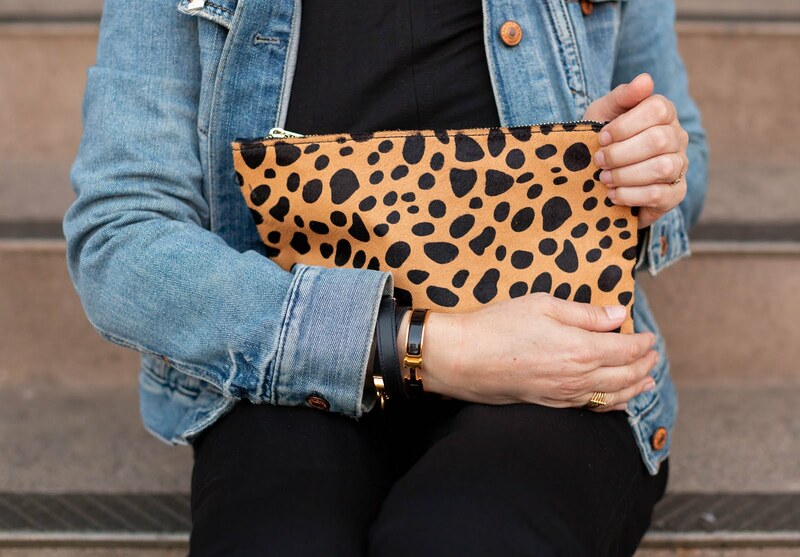 Love that clutch too! I love a good jumpsuit and those red boots with it is really perfect. It's too bad they're already showing signs of wear. That's always the worst.